Travelling by plane is no fun these days what with wasting three hours at the airport before each flight and all the extra security measures one has to endure. The Vancouver to San Diego trip was even worse than usual since there was no direct flight available and we had to change planes in Seattle and each flight was delayed. Finally we arrived gratefully in our room in the downtown hotel in San Diego at 10 pm, only to hear the sound of a train toot, tooting. Yes folks, the Amtrack and the local train service go right through the downtown area, just two blocks from here and although there are barriers which come down, the train toots its way along past every crossing, until very late at night. Ah well. Actually we thought it was pretty funny and laughed every time one went past. But San Diego is for me is the action packed harbour, so early this morning we went straight down to investigate this ship which we can see from our hotel balcony. It’s the Star of India and forms part of the Maritime Museum of San Diego, a collection of various types of historic boats which can be seen moored at the Embarcadero. 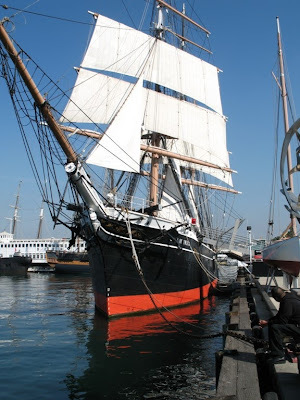 The Star of India was launched in 1863 and is the oldest ship in the world that still maintains a regular sailing schedule. 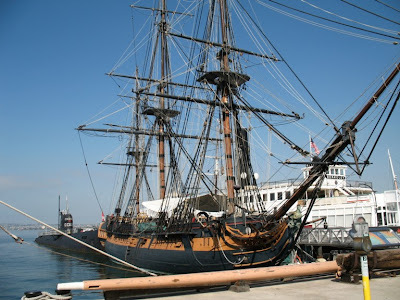 The HMS Surprise is a magnificent replica of a late 18th century Royal Navy frigate and she was used in the production of the film, Master and Commander: The Far Side of the World. Wings, built in 1931, is one of the Pacific Class wooden hulled boats, racing yachts designed locally and for southern California waters. They immediately began to defeat the formidable East Coast “S-boats”. 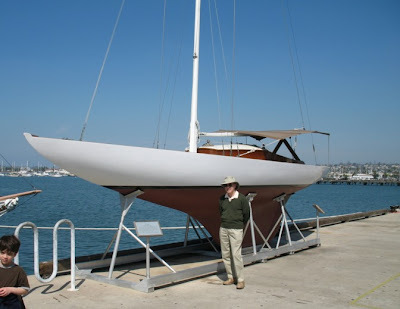 Thirty of these wooden boats still sail and race in San Diego harbour. 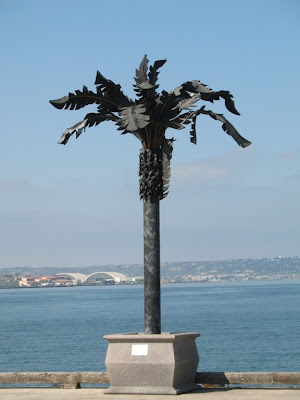 Along the Embarcadero is a collection of thirty modern sculptures which are called Urban Trees. This one does indeed look like a tree, although its name is a rather cryptic RT 6A89. 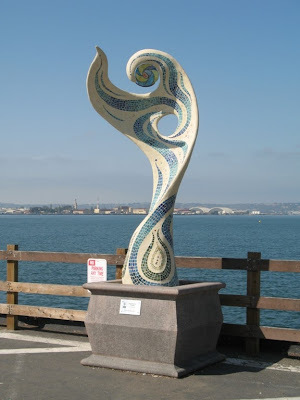 These are part of the Port of San Diego’s Public Art Program and they certainly enhance the walkway. They are an annual event and remain in place for one year when the next year’s “crop” replace them. While still labelled an urban tree this work called Aquamarine Dream is more of a traditional sculpture rather than a tree. This is the upper half of a very whimsical “urban tree” called Family Tree by the Sea. 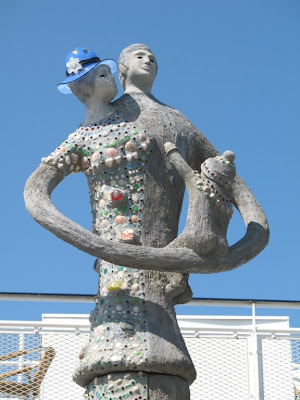 The female half of the sculpture is embedded with coloured stones while the male half is plain concrete. The baby sits on the “branch” which represents the conjoined arms of the couple. 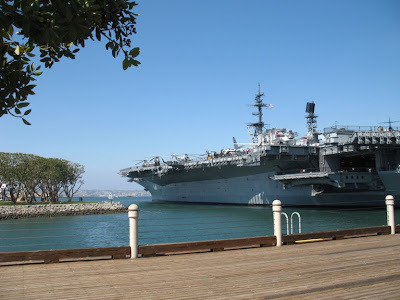 After the long walk along the Embarcadero we came to Seaport Village where we had lunch and I took many photos which I will post another time, since this post is a bit long. In the afternoon we took a two hour cruise around the harbour. Like Sydney Harbour there is a lot of action as there is always something coming or going and the very heavy presence of the US Navy lends a lot of interest to the local scene. However the next post will be the Saturday Photo Hunt because I had the most perfect photos to represent the theme for this week which is METAL. My cataract surgery also involves appointments at various times beforehand, so I am taking the opportunity to take a short vacation between a couple of them. 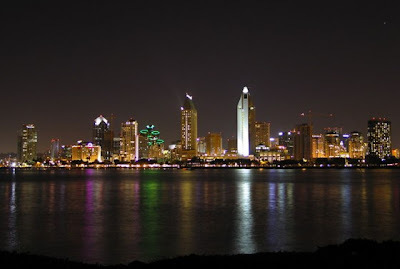 Today we will be flying to San Diego, a city of which I am rather fond, perhaps because it puts me in mind of Sydney, our hometown, although they are quite different. I have been there several times before although quite a long time ago. 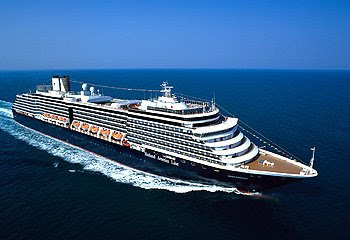 After a few days in the city we will be taking a seven day cruise down to Mexico on the Oosterdam. I booked this quite last minute and was not able to get the cruise I had in mind but I’m sure this will be a nice break and I won’t have to cook any meals for a while which is a plus for me. Not only that, I will probably go to visit my favourite zoo in San Diego, which I like just as much as Sydney’s Taronga Zoo and that’s saying something. I will be taking my laptop and the hotel in San Diego has free internet connection. As well I will pay an arm and a leg for internet connection on the ship but since it is so expensive I will probably only be checking my email and hopefully posting something to this blog via email, with the occasional image, now that I have discovered how to do that. So my blog visiting will be virtually non existent during the next ten days, I’m afraid. I hope I can find something interesting on this trip to share with you. Take care my dear blog friends and do enjoy whatever it is that is keeping you occupied these days.